Back at the beginning of July, I shared with you my intention to take A Break from Blogging while we spent some time renovating and moving into a "new-to-us" home. We were just getting ready to head out on a family vacation at the time - a road trip out west from our home state of Michigan - and were coming home to begin work on the new place. We just took possession of the house at the end of July, got the keys in our hands and have now started some minor work that we'll be doing ourselves while we wait for contractors to start work on the addition we're having added on. We won't be relocating to the new house until most of the renovations are complete. I plan to return to recipe blogging sometime in the fall once we're settled into the new place. (One of the major things that drew me to this house is the fantastic natural light in the kitchen and sunroom - great for taking photos of the food I share here with all of you.) In the meantime, I'll be sharing bits and pieces of our renovation (maybe along with a few DIY tutorials if all goes well) here on the blog for those who may be interested. (Thank you to so many of you who have inquired about the new house and are asking how things are going.) I'll be adding a new tab to my page soon and will allocate my updates about the house there. Our first projects are centered around the kitchen. We're trying to stick to a strict budget in the kitchen, so I've been spending a great deal of time researching DIY tutorials for cabinet staining and such online. I just received my shipment of General Finishes Java Gel Stain and General Finishes Poly/Acrylic Satin Finish for my planned updates to the kitchen cabinets. The drawers, doors and hardware are all off, everything has been cleaned and sanded ... and I will be staining all this week! And, I'll be removing the existing grout on the ceramic tile counter tops ... followed by a complete re-do of those. We're tearing out carpet and paneling soon, too, in a couple of the existing rooms and repainting most of the entire house. Below is a photo (with planned updates noted) of the kitchen shortly after we took possession of the house. The three-bedroom, two-bath house was built in 1955 and is located just a few miles from where we've lived for the past five and a half years. It is set on four acres in the country, but is only about nine minutes from our kids' schools. We'd been watching the housing market in our area for quite some time and needed to find a bigger place. The decision to try to get this particular house was made completely at the last minute - like, the night before it was going up for auction. An elderly couple had lived in the house for around forty years. After both parents had recently passed away, the sons (now in their sixties and with their own established families and residences in other areas of our state), held an estate auction to sell both the home and its contents. Some of the interior is a little outdated - the cabinets are in good shape, but need a facelift and the paint colors don't reflect our taste. I'll be renovating the bathrooms a bit, too, and like I mentioned, we'll be having some new flooring installed prior to moving in. 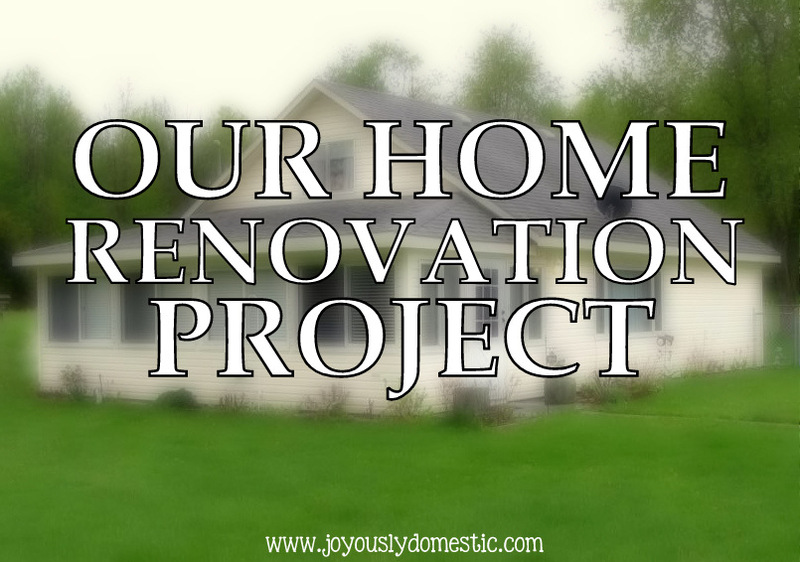 So, for those who might like to follow along on our DIY renovation journey, stay tuned for updates while all of the pieces fall into place over the next couple of months. And, I'll be back to sharing recipes and the other "normal" Joyously Domestic content once things settle down for us and life gets back in track. Thank you for your loving support and I truly do appreciate your patience during my break from recipe posting during this transitional time in our lives. Thank you so much, Angela! And, yes, I'm hoping for a calm winter season, too! Amen to that. Congratulations on your new home! Looking forward to updates on the renovation. Hope it all goes smoothly. Miss seeing your posts.